It’s good I started the sock over again because I realized I had been doing the double decrease wrong. I realize everyone and their mother in blogland has made Jaywalkers, so, this is hardly revelatory information, but when you slip the two stitches knitwise for the double decrease, slip them together, not indiviudally. Okay, above is a photo of the sock waiting for Billy Joel at his Wednesday Final [ish] Play at Shea. I have always like Billy Joel, even though I know he is considered a little lame by many people. My theory about Billy Joel is that he’s like the Vows section in the New York Times–everyone is a fan, no one wants to admit it. * (If you read the Sunday New York Times, you read Vows, aka “the wedding section,” aka “the women’s sports pages,” even if you’re a man. It’s a fascinating section and if you claim you don’t read it, you’re lying.) *Except if you’re from Long Island, whose entire population showed up at Shea, I think. They love Billy Joel, without shame or reservations. Anyway, in college, my roommate and I (okay, it was mainly me) somehow borrowed a Best of Billy Joel tape from our neighbor (which dates when I went to college–people still had tapes, though even then, they were rare) and we were like, damn these old people, because we totally would have gone to see him in concert, if the tickets hadn’t been so expensive. But when I saw that he was playing at Shea, I thought that maybe the tickets were free, so I googled the concert the day of the event, and though it was not free, additional tickets had been released for that night. So, I was like “Hey! It’s historical! They’re tearing down Shea! We should go!” It was definitely fascinating. Though there were times that I felt like I was part of some crazy Manchurian-Candidate-esque stadium event (especially after John Cougar Mellencamp appeared and everyone started yelling “USA, USA,”), even I was touched when the entire stadium sang “Piano Man” to the Bard of Long Island. P.S. My love for Billy Joel does NOT extend to a capella groups, which I hate, and who seem to share a love for Billy Joel. I’m guessing that my friend who hates the Uptown Girl video never saw an even worse video…For the Longest Time. 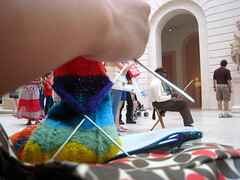 PPS It’s been so hot, I’ve been knitting wherever there’s air conditioning…the subway, the museum, etc. Billy Joel isn’t from Long Island, he’s from Nassau County. If you live there, you might as well be in Queens. Though he does have a house out in the Hamptons now (which aren’t the real LI either, but at least they’re in Suffolk). And I’m told that when he sings “New York State of Mind” in concert on Long Island, after the line about “The New York Times, the Daily News,” he adds “Newsday too,” which is an el cheapo pander if I ever heard one because no one who has ever read Newsday could possibly miss it after leaving the area. I’ve only seen one Billy Joel video in my life, but I can’t imagine any other being worse. This was the one for that song he did about teenage suicide, where he dresses in a black outfit and manifests himself out of nowhere to some teenager who is about to off himself and talks the kid out of it. Billy was about 50 at the time, and when I saw it, I thought, “Yeah, right, I’m sure you’re the first guy today’s 15-year-olds would take advice from.” This was before he started driving drunk, or at least before he started getting caught. Isn’t it dangerous to take a sock to a rock concert? What if it’s really great and they rock your socks off? If you’re a person, all you’ll lose is your socks, but if you actually are a sock, you’ll disappear! Actually I guess this isn’t much of a risk with Billy Joel.